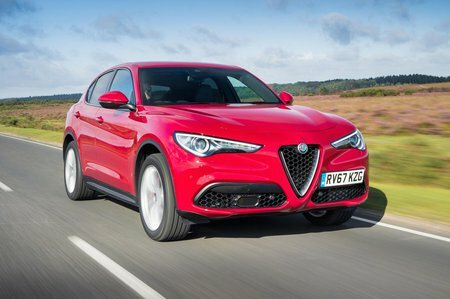 Alfa Romeo Stelvio 2.9 V6 BiTurbo 510 Quadrifoglio 5dr Auto 2019 Review | What Car? What Car? will save you at least £0, but our approved dealers could save you even more. Not just a Stelvio with a 503bhp V6. It gets 20in wheels and bi-xenons as standard, as well as special leather/alcantara sports seats, sport suspension with adaptive dampers, uprated brakes, a torque vectoring active rear differential and a fully switchable stability control system. Carbonfibre seats and carbon brakes are optional. Twin-turbo V6 performance version makes a heady-sounding 503bhp in this Mercedes-AMG GLC 63 rival. It revs keenly, but wants for a little mid-range torque – and a really soulful Alfa V6 soundtrack. Standard eight-speed auto ‘box works well with it on the road, but doesn’t always shift quickly enough when you’re driving with serious intent.